Maybe it’s the energy you feel while strolling with friends and family along the downtown sidewalks bordered by small shops and charming restaurants, all decorated for the season. Or the brightly lit holiday window displays and lampposts with twinkly lights that beckon you to browse the boutiques. Maybe it’s the wide array of restaurants pumping out tantalizing aromas and offering a warm welcome for visitors yearning for a delicious meal or late night bite. Or the many bars and taphouses bustling with crowds full of holiday cheer. And beer. Carolers can be found singing holiday favorites throughout the downtown (find a full schedule at DowntownWestChester.com), while Christmas decorations bedeck the Historic Courthouse lawn. And a nationally recognized parade will fill the downtown with excitement and cheer on one special night. 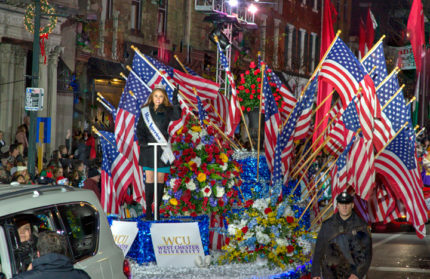 There’s so much that makes West Chester the spot to be for this festive holiday season. Stop by the Key Financial tent for a special treat this year. Folks from miles around are drawn to West Chester for its annual Christmas parade, this year on Friday, November 30. Hosted by the Greater West Chester Chamber of Commerce with the support of title sponsor QVC, this holiday parade promises to fill the streets of the downtown district with spectacular floats, giant inflatable character balloons, dozens of marching bands—from West Chester University and local high schools—dance troupes, antique cars and much more, which of course includes Santa’s arrival! Join the fun accompanying the parade at the Holiday Village on High Street where vendors and local businesses offer complimentary treats and plenty of family fun. Make sure to stop by the Key Financial tent for a yummy cup of hot chocolate. Work up an appetite with a sprint around the borough for the Jingle Elf Run, a walk/run event for all ages with prizes for the best costume and for top finishers. So mark your calendar for November 30 to join the celebration in person, watch it on TV or catch the rebroadcast of the parade during the holidays. Plenty of ways to enjoy the fun! Although Small Business Saturday is designated as the Saturday after Thanksgiving—November 24 this year—there are many reasons to shop small, locally owned brick and mortar businesses all year long. And more fun can be found every day exploring stylish shops and unique boutiques for new seasonal favorites while discovering recently opened shops in town. This year, a half dozen new shops add to the retail mix, making West Chester your one-stop shopping destination for everyone on your list. Are you expecting a new addition to your family? Is there a child or grandchild who could use new nursery items or clothes? 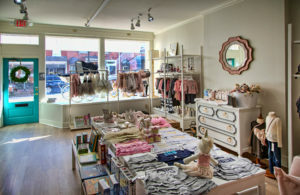 Luxey Little Ones (135 E. Gay St.), recently opened by Jennifer Poe, is a luxury baby and child boutique from Rittenhouse Home. It’s actually more like a style showroom, carrying exclusive private label bedding, handcrafted luxury furnishings, and must-have designer items for babies and toddlers. Jennifer’s work with her award-winning luxury interior design, furniture and cabinetry studio at Rittenhouse Home helps her curate amazing interiors. Her team of experienced interior designers can professionally design your child’s nursery or bedroom to reflect your personal style. When you step into Thrifty Vintage (14 N. Church St.), your first impression is a cozy, rustic vibe. Which is good, since that’s the shop’s theme. It’s easy to see how hard Beth Stiles, owner and proprietor, has worked to achieve a funky and creative gift and home decor shop. And Beth is not shy about applying her own imagination and originality to other pieces as she refinishes furniture and collaborates with homeowners on decorating projects. You may even catch her working with decoupage and digital scrapbooking. Is there a furry friend on your list you just love to spoil? Of course, we all have one. And for those who love the canine branch of the family, there’s All the Dogs (13 S. Church St.) as your gift destination. You’ll find lots of crafted doggy gear, healthy treat selections, toys galore and even skincare products to support the wellbeing of your pet. Owner Becky Hoffman and her cousin Cori Hoffman are dedicated to offering products they believe are healthy for pups of every breed and need. They’re constantly testing what they offer to ensure we humans get it right. You can follow their thoughts on dog care along with their adventures at their All The Dogs blog. 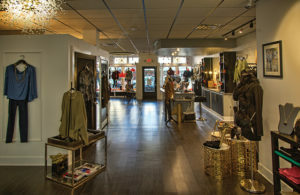 Step into La Chic Boutique (14 W. Gay St.) and it feels like a bit of Manhattan has come to West Chester. Owner Alysha Martinelli takes care to select clothing designed for women seeking styles suited for a professional look or an elegant evening. Each designer item, from belts to dresses, will transform you and create a distinctive and chic style all your own. Retro is big with music fans as evidenced by Creep Records (133 W. Gay St.), now bringing vinyl-focused recordings to collectors. Recording styles for music are changing, but vinyl is still viable and new vinyl is as much a part of the scene as quality used vinyl. 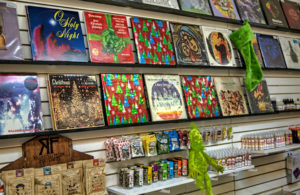 The store has genres ranging from indie and punk to metal and hip hop. There’s mainstream and there’s underground, and customers will have a great time exploring the music experience at this new shop. With Clutch WC (25 S. High St.), you’ll find carefully sourced brands that won’t fade with changing trends. 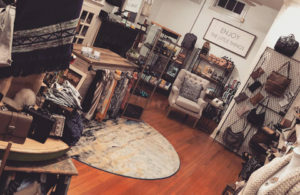 Store owner Lauren Speakman has embraced a charitable mission and works with companies like Pura Vida, Lokai and the Awesome Company, where a portion of the proceeds go to support good causes. But the quality is never compromised and customers will find each item fashionable and durable. Downtown West Chester has much more to offer beyond new shops and long-time favorite shops serving generations. Look for 44West, a project from E. Kahn Development, which has broken ground at the old Mosteller Building site at the corner of Gay and Church Streets. Although it’s already begun, the 44,000-square-foot mixed-use development (office and retail) won’t be completed until next winter. You’ll see a plaza that includes public art and a two-level courtyard fountain with cascading water. Plans are to minimize local traffic disruption with only sidewalks closed around the construction site. Yes, things are happening downtown. As always, there’s plenty to do at the Uptown! Knauer Performing Arts Center for the holidays, including Resident Theatre Company’s Lend Me a Tenor, December 14–30 (see the article in this issue). There are also the monthly Jazz Cocktail Hour, popular Dueling Pianos, Holiday Cheer & Show, Family Jazz Night with classic soundtracks of holiday cartoon music, like “A Charlie Brown Christmas” featuring Grant Youngblood and Chadds Ford area school choirs. Capping another great year is Puttin’ On the Glitz, a New Year’s Eve celebration. Join the fun and support Uptown! as you enjoy dining, dancing and entertainment. See the West Chester Events section for details. And finally, Chester County and the West Chester Borough have partnered to launch a new walking route. Part of a national WalkWorks program, the route begins on North Walnut Street and is designed to encourage people to walk a 2.4-mile scenic tour capturing West Chester’s heritage and beauty while passing downtown West Chester, West Chester University, Everhart Park, the Justice Center, and ending at the Chester County Historical Society. Signs are posted at each turn along the way, with maps available at the start. Something fitting for the 2017 Great American Main Street Award winner. 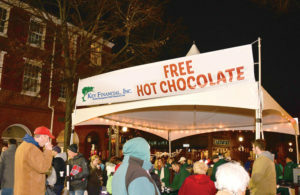 For more information about events in West Chester, go to DowntownWestChester.com.